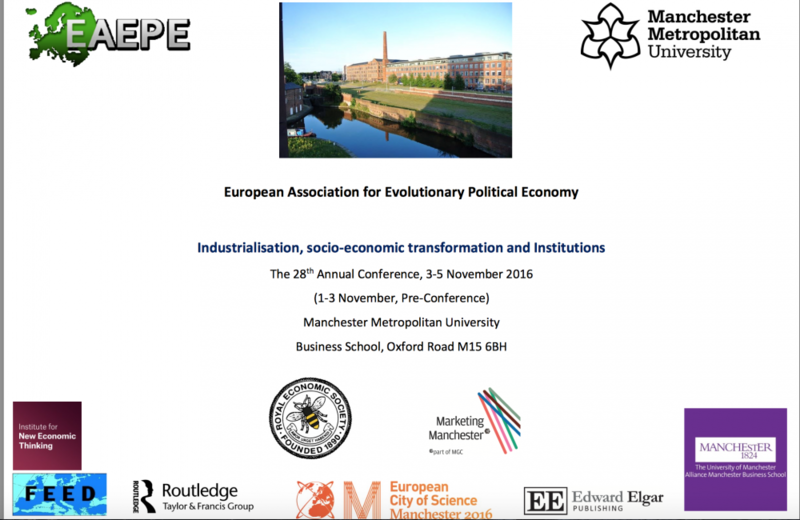 MADAS Professors Magda Fontana and Paolo Racca will present their paper “Topic Modeling and historical thinking: a tale of uncertainty in economic thought” during the Session on Complexity and Evolutionary Economics at The 28th Annual EAEPE Conference 2016 that will take place in Manchester on 3-5 November 2016. The organisers intend to celebrate the legacy of Manchester’s status as a cradle of the Industrial Revolution that determined the global path for well-being creation by manufacturing and technologies, and later by services and creative industries. The conference theme also recognises how Manchester has shaped the people’s history and encouraged intellectual advancements on such important issues as workers’ rights, trade unions, co-operatives, civil rights, and liberal critique of the shortcomings of the capitalist system. The North-West of England is specifically, known for experiencing the consequences of deindustrialisation as well as successful examples of recovery. Many problems have not yet been solved, but the prospects of further regeneration and sustainable progressive long-term development through the opportunities linked to the knowledge economy, creative industry, services and progressive business formats, it is believed, could provide footing for the successful future of the region. Participants are encouraged to engage in a relevant discussion from the angle of regional specificities and challenges through contributions that could shape political and economic discourse on sustainable solutions to socio-economic dynamics.